As in past years, my heart has been greatly burdened this week for all for whom this Mother's Day will be painful. I think of so many friends and loved ones (both single and married) who are longing for motherhood, Mommies grieving the deaths of your precious children, those in strained/hurting/broken relationships with their moms and/or children, and my precious friends who are grieving the losses of their own mothers. My heart is burdened to pray not only for each of them individually, but also for the countless, nameless, faceless masses of women who are grieving and dreading this weekend. A wonderful new realization occurred to me today. If God is burdening my heart like this, as I'm sure He is burdening many others to pray as well, then it is very probable that back at that horrid Mother's Day of 1994 when I was so overwhelmed with grief and depression, He was burdening someone (maybe many "someones") to pray for me as well! 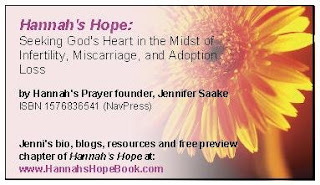 I may have been on her heart specifically, or I may have been part of her burden for "all infertile women hurting this Mother's Day," but the reality is that God honored those prayers! As alone and discouraged as I felt, God's hand was there. In my own strength I could only have given into despair, but in God's grace He redeemed by pain for His glory. Where would I be today had it not been for those prayers that someone lifted before the Throne of Grace? Was it you who prayed for me? If so, there are not words of adequate thanks! Are you the one in need of prayer this year? If so, please be encouraged - God has not forgotten you and you are on the hearts and in the prayers of countless women who have already walked this path ahead of you, along with many who yet join you in the ongoing grief and use their own pain as a catalyst to pray. For Mother's Day this year I have asked my husband for flowers and asked my pastor to allow me to place these at the front of our church and run a small notice in the bulletin simply stating, "The flowers at the podium are placed in prayerful and loving honor of all mothers and mothers-at-heart, with special recognition of those for whom this holiday may be painful: those who have lost mothers or children, women longing for motherhood, and mothers and children in broken relationships." While we may not be sitting together this Sunday, these flowers are in your honor as well! Simply beautiful. Thanks for your encouraging and uplifting post. Very encouraging, Liza... thank you.